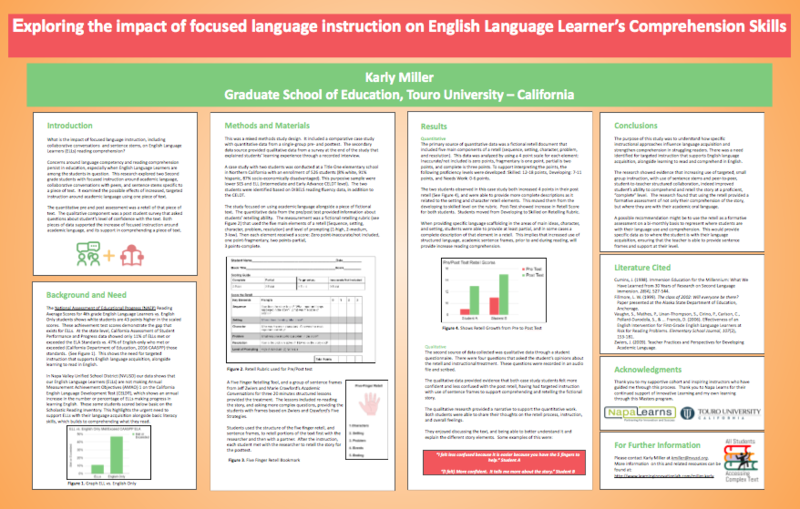 My research was to understand how specific instructional approaches influence language acquisition and strengthen comprehension in struggling readers. Furthermore, I explored other ways we might provide feedback to student's in understanding text. Traditionally we as teachers provide feedback, but how might we leverage feedback by using technology? ​The National Assessment of Educational Progress (NAEP) Reading Average Scores for 4th grade English Language Learners vs. English Only students shows white students are 43 points higher in the scaled scores. These achievement test scores demonstrate the gap that exists for ELLs. At the state level, California Assessment of Student Performance and Progress data showed only 11% of ELLs met or exceeded the ELA Standards vs. 47% of English-only who met or exceeded (California Department of Education, 2016 CAASPP) those standards. This shows the need for targeted instruction that supports English language acquisition, alongside learning to read in English. In Napa Valley Unified School District (NVUSD) our data shows that our English Language Learners (ELLs) are not making Annual Measurement Achievement Objectives (AMAO) 1 on the California English Language Development Test (CELDT), which shows an annual increase in the number or percentage of ELLs making progress in learning English. These same students scored below basic on the Scholastic Reading Inventory. This highlights the urgent need to support ELLs with their language acquisition alongside basic literacy skills, which builds to comprehending what they read. This will give you a quick overview of my initial Capstone Action Research where I worked with a group of students to provide language supports and a comprehension tool (Five Finger Retell). Specific language scaffolds provided an increase in description of specific story elements. Providing a tool (Five Finger Retell) for students to remember retell elements proved helpful.